The SCOUT IDE clinical trial is an FDA regulated investigation (IDE G140140) being conducted at multiple sites across the U.S. This study evaluates outcomes for an investigational porous mesh graft containment system in an interbody fusion application. 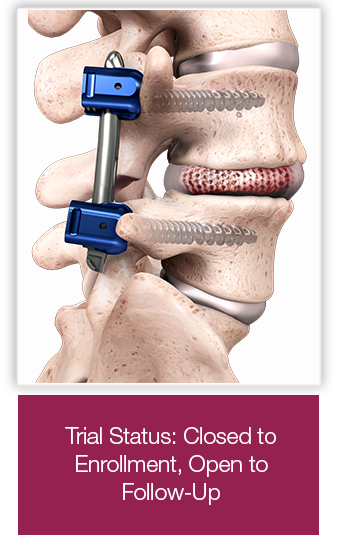 The study device is placed at a single level in the disc space within the lower spine and filled with bone graft material. The surgery level is then stabilized through the addition of supplemental fixation (screws and rods). The target study population is skeletally mature individuals between age 21 and age 80 that have symptomatic single level degenerative disc disease ("DDD") requiring fusion. Study participants are followed for a minimum of 24-months after their study procedure. Study evaluations include physical examinations, patient surveys and radiographic imaging (x-rays/CT scans). To participate in this trial, subjects met specific inclusion and exclusion criteria. A complete list of the study entrance criteria, site locations, and study endpoints is available at www.clinicaltrials.gov.